WASHINGTON, D.C. -- President-elect Donald Trump’s education secretary pick Betsy DeVos’ sparked outrage among Democrats and many on social media on Tuesday when she cited the threat posed by grizzly bears in her response to a question about guns in schools during a confirmation hearing on Capitol Hill. Connecticut Sen. Chris Murphy, who has pushed for stricter gun regulation since Sandy Hook Elementary School shooting in his state, asked DeVos during the hearing if she supported guns in schools. “Well, well I would refer back to Senator Enzi and the school he was referring to in Wapiti, Wyoming, and that there is probably a gun in the school to protect from potential grizzlies,” she said. Murphy later tweeted that he was “shaken to the core” by her answer. DeVos’ failure to oppose guns in schools outright earned her censure from her interlocutors, but it was her mention of grizzlies as a justification that sparked outrage on social media. The school that was referenced earlier in the session is the tiny Wapiti Elementary School in rural Wyoming, which installed a bear fence around its playground in 2002 after a number of incidents involving bears, according to a 2005 Denver Post article. That wasn’t the only controversial topic DeVos responded to during her hearing Tuesday. DeVos also said Tuesday that American parents must be able to send their children to high-quality schools, including charter, magnet and religious schools, if public schools are failing. Committee Chairman Lamar Alexander, R-Tenn., a former education secretary, expressed confidence that DeVos is an “excellent” choice for the job. “She is on the side of our children,” he said. 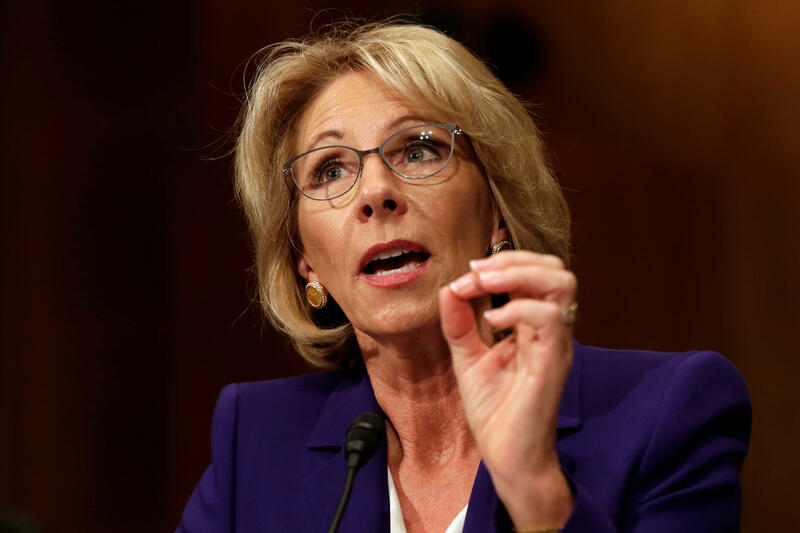 But Sen. Patty Murray of Washington state, the top Democrat on the committee, said she was “extremely disappointed” that DeVos has not yet finalized her financial and ethics disclosures ahead of the hearing. “Over the course of her career as a major campaign contributor, soft-money donor and lobbyist, DeVos has used her considerable wealth to influence legislation and the outcomes of elections to advance policies that have undermined public education and proved harmful to many of our most vulnerable students,” the letter said. LGBT groups also have protested Trump’s choice of DeVos, saying she has funded conservative religious groups that promote what they consider to be traditional family values, including one organization that supports conversion therapy - counseling of gay, lesbian, bisexual or transgender people with the aim of changing their sexual orientation. “I believe Betsy DeVos has the talent, commitment and leadership capacity to revitalize our public schools and deliver the promise of opportunity that excellent education provides, and I support her nomination as U.S. secretary of education,” Moskowitz said in a statement.